April | 2012 | Expecto Patronum! Need a solid guide to dueling on Pottermore? ElmBlade43 has provided a fairly comprehensive guide in yesterday’s blog post: Dueling 101. I have more than 5,000 dueling points and average 142-143 potency per duel, but that doesn’t mean there’s not still plenty more to learn. I got some great ideas from ElmBlade’s post and hope to use them to take my game to the next level. Here’s to a 144 average, baby! This afternoon, my husband attempted the practice potion. He had the same difficulties everyone has the first time brewing, but when I asked him if he blew up his cauldron, he said that he didn’t really see anything very dramatic happen to his cauldron. I attempted to show him what an exploding cauldron looked like. I went to the practice potion, tossed my snake fangs in the mortar and chopped them up, put four measures in my cauldron, and then intentionally overheated the cauldron during the 10 second countdown before waving my wand. Black specks flew out of the cauldron, and the potion turned a sickly green… but no melted cauldron and no green goo splattered all over my workbench. I have since searched the Web for a picture of a properly exploded and melted cauldron, but to no avail so far. So… Did Pottermore eliminate the exploding cauldron to increase bandwidth (and decrease excessive expenditure of galleons)? Will the exploding cauldron become just one of those Beta memories… albeit a rather dramatic one (and a good source of self-deprecating jokes). Well, whatever the case, while I was looking for photos of exploding cauldrons, I did come across some very helpful Potions videos by StormChestnut89 – one of the Gryffindors on the leaderboard in the Great Hall… and one of my occasional dueling partners. Also be sure to check out StormChestnut’s YouTube Channel for some great tutorials showing how to make specific Potions. ETA: ElmBlade demonstrates in the Comments thread that Cauldrons do indeed still explode on Pottermore… just not in the practice potion. 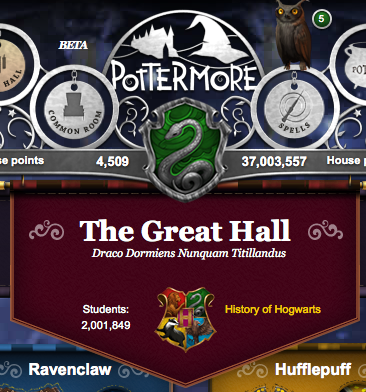 Pottermore: So What’s in the Trunk? If you are new to Pottermore and are wondering about what items you can collect, I’m about to give you a list of all the items in my trunk. But I’ll let you figure out where to find them. I don’t want you to miss out on the fun! So just zoom in and out of each scene, and move your cursor around until you find something that lights up in purple… or are sure that there’s nothing there to find. Since my trunk has a full collection of the trunk items for Book 1, I thought I’d share with you the whole list. I’ve indicated the purchased items with asterisks. The rest were collected… or at least used in some context. In addition to the items in the trunk, there are 10 findable Galleons lying around. These will earn you points… AND earn you Galleons. There are also two findable spell books that do not go in your trunk but that earn you points when you find them… and give you a lot of spells that you can use for dueling: The Dark Forces: A Guide to Self-Protection and (everybody’s favorite spell book) Curses and Counter-Curses. And finally, here is a list of the collectible ingredients sitting on my Potions Shelf. The replenishable items can be collected repeatedly – meaning that you never have to purchase these items for your Potions. I hope these lists are helpful to those who are new to Pottermore.